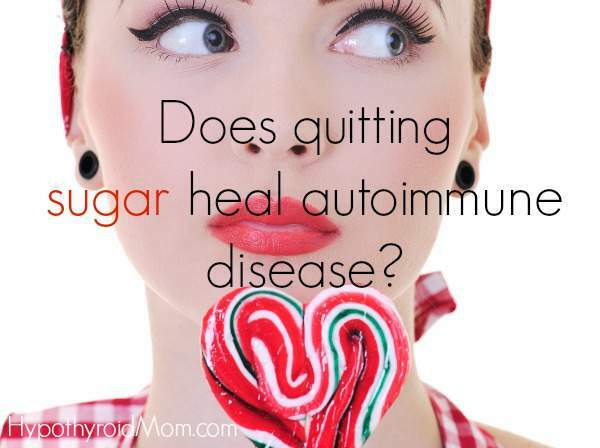 Does quitting sugar heal autoimmune disease? I am a fan of this Australian journalist and TV presenter named Sarah Wilson. She is the author of the Australian and UK best-sellers I Quit Sugar and I Quit Sugar For Life. I Quit Sugar was released in the USA and Canada April 2014 and is a New York Times best-seller. I was a sugar addict (yes I confess) so quitting sugar has been a big part of my personal path to thyroid wellness. Sarah’s book was extremely helpful. Thank you to Sarah for sharing her story of thriving through Hashimoto’s disease here at Hypothyroid Mom. This is actually a post I’ve been busting to write for a while. I first quit sugar because of my autoimmune (AI) disease. I have Hashimoto’s. And a big part of why I’ve stuck to the sugar-free program is that it’s made such a damn big difference. My hormone levels have fallen back into the right range. Warning: As I always remind people, even if you don’t have an AI, you’ll probably find it helpful because the advice I share relates to all of us. Or you probably have a loved one who has an AI…please share this with them. For me, I know my AI issues stem back to a sugary carb addiction in my late teens. It led to gut issues, insomnia, addictions, hormone issues, nervous disorders, adrenal collapse…and then Graves (another form of thyroid disease)…and then Hashimoto’s. Anyway, I reckon that’s enough for now. It was quite a rant. Sarah Wilson is an author (her book I Quit Sugar hit the New York Times bestseller list), blogger, and wellness coach whose journalism career has spanned 20 years, across television, radio, magazines, newspapers and online. She’s the former editor of Cosmopolitan magazine and was the host of the first series of MasterChef Australia, the highest rating show in Australian TV history. She appears regularly as a commentator on a range of programs including Channel 7′s Sunday Night, The Morning Show, Sunrise and Weekend Sunrise, Ten Network’s Good News Week and The Project, Nine’s 60 Minutes and A Current Affair. Sarah lives in Sydney, rides a bike everywhere and when asked what her hobbies are cites “bush hiking”, planning her next meal, and being fascinated by other people with real hobbies. I was diagnosed with Hypothyroidism earlier this year. I am now told that due to this condition I have high cholestrol. I am already a ‘healthy’ person. I hardly eat any sugar; I eat a fibre rich diet; I exercise everyday – mostly at a high level; I only occasionally drink alcohol; I eat lots of fruit & nuts; hardly any dairy except for an occasional ice cream and i don’t smoke. not smoking; not drinking etc are all things I am already doing. I’m an amateur at all of this myself, but I wonder if you might want to focus on a more alkaline diet, and maybe even reduce the amount of fruit you’re eating. It’s sugar too, though not like refined sugar. There’s the Paleo Auto Immune diet- very restrictive but if you want to try tackling it with diet, this may be a good thing to try. @Clive….the facts on cholesterol are a bit muddied. Having high cholesterol doesn’t necessarily mean you are not healthy, although I can’t see your blood work to know for sure. I have read many times that Paleo people have high cholesterol levels. Without eating sugar, my good cholesterol is very high. Also complex carbs are healthy only in moderation and simple carbs are just sugar. Only fruit with a lot of fiber is healthy, ie. bananas are sugar laden.